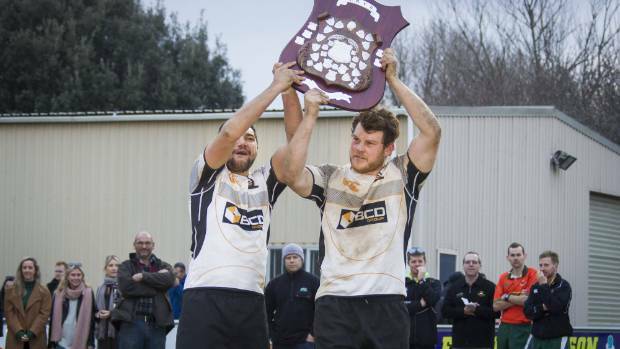 A dominant final 15 minutes saw New Plymouth Old Boys run away with the CMK premier Taranaki club rugby title at the TET Stadium, Inglewood, on Saturday. After a tense, even opening 65 minutes, Old Boys broke the shackles with three converted tries late in the game to swamp Coastal 29-9. Tupou Vaa’i got things rolling for the city side when he crashed through some compact Coastal defence. Referee, Will Johnston, who was officiating his third successive final, deferred to his assistants before awarding the five pointer, which Brayden Northcott-Hill converted. The try gave Old Boys the lead and changed the game. Shortly after Vaa’i, the former NZ secondary school rep who has been signed by Taranaki, unleashed a barnstorming run. From the resulting ruck replacement Jayden Ford dived over. Then with time up, Jahmarl Weir scored a brilliant 50 metre solo try, beating five defenders in the process, Old Boys had scored a magnificent 21 points to conclude its season in the most emphatic fashion. It was terrible end to what had been a gutsy final performance, on the back of a highly profitable season, for Coastal. Weir scored the only try in the first half, and with a penalty by Daniel Waite, Old Boys held the lead at the interval, 8-6. The first 20 minutes of the second half was all Coastal. But its only reward was a penalty goal to the impressive Rick McKenna, to add to the two sweet strikes he had in the first half. Coastal’s pack had performed manfully, especially Tevita Fa’ukafa, but a combination of factors meant the ball did not hit the backline with the speed needed. The experienced Brett Goodin had his own minties moment, knocking on from a quick penalty kick in front of the Old Boys’ posts. And in a simplistic sense that summed up the match – Old Boys were far more lethal in taking opportunities, as the 4-0 tries count indicated. Golden point extra time was required to finalise the division one title, after Southern and Coastal had tied 14-14. Regan Corbett scored the winner for Southern, enabling them to win 19-14. In the other grades, Spotswood United defeated Old Boys 39-20 in the colts finale, Inglewood pipped Coastal 20-17 (division two), Stratford-Eltham beat Toko 24-10 (division three), Spotswood United triumphed 25-17 over Southern (Under 13 restricted A) and Tukapa took the Under 13 restricted B crown 41-29 from Stratford.